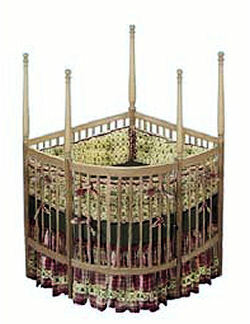 Often overlooked, corner baby cribs, are an excellent choice for parents who are choosing furniture for a small nursery. The key to making the most of what little space that you have in a home or apartment is to put every square inch to good use. People are often amazed at how much bigger a tiny room can look when you make the most of those corners that are often completely overlooked. It is so easy to tuck the baby's bed into one of the nursery's corners that otherwise would be an empty space. This simple decorating trick will leave a much larger area in the center of the room which makes the room see more open and spacious. Many parents say that the triangular shaped baby bed makes it easier to keep an eye on baby as well as making the infant more accessible from different angles. Some reviews say that the wedge shape makes this the best crib for twins. See more sheets, bedding and corner crib styles here. WILL I BE ABLE TO FIND SHEET SETS AND BEDDING FOR CORNER BABY CRIBS? 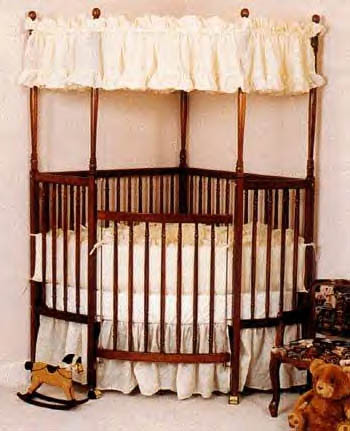 At one time, selection of crib sheets, mattresses and baby bedding for odd shaped cribs were hard to locate in stores or online. However, at the time of this article there are several very pretty nursery bedding collections made specifically for corner cribs. A few have curtains for the crib canopy. If you can’t find fabric that fits with the theme of your small baby, it would be easy to make your own baby bedding or pay a seamstress to make a custom set for you. 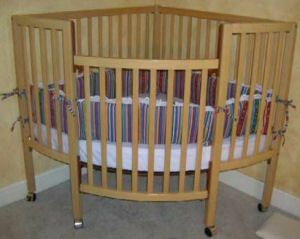 Can I make my own corner baby crib? I have included a resource for corner crib woodworking plans on this page that include easy to follow step-by-step instructions and diagrams. The turned spindles and corner posts add a lot of style to this piece. HERE is a set of corner crib plans with easy to follow, step-by-step instructions that would be a great project for the carpenter in your family. These crib plans are for a bed with a drop side rail that features adjustable mattress heights. Even with the turned spindles, it should be an easy building project for an experienced woodworker. These are not free crib plans but relatively affordable and you could save money using them to build your own crib assuming you already have the tools and hardwood that you would need for the project. The Baby Trilogy spindled corner crib was the corner baby crib of choice for parents looking to save precious floorspace in their baby's nursery until a few years ago when it's reported that the company went out of business. Since that time there have been many posts on message boards made by parents looking for crib parts and hardware and crib assembly instruction manuals. Sadly, it appears that the best chance these people have of repairing or getting the instructions for how to put a Baby Trilogy corner crib together safely is to hope that another owner of this crib will come to their rescue or to watch Craigslist classifieds and Ebay auctions and find a used corner crib for sale and request a copy of the owner's manual or even buy it for the used parts. If you are debating on whether to buy a separate changing table, this feature may help you to make your decision. The corner baby crib will provide a quick and easy changing surface which is a good thing for the mom that doesn’t have room for a changing table. This means less nursery furniture to buy and to fit into your nursery that will eat up your precious floor space. WHAT IF WE HAVE MULTIPLE BABIES? If you have two babies in the nursery at one time, corner cribs may be the answer to your problems of coming up with a way to fit two (or more) standard size baby cribs into your limited space. Baby gear for twins and multiples take up more room than the equipment necessary for a single baby, and there’s no way to get around the need for double the amount of many items. The key is to find a way to design and organize the nursery in the most efficient fashion. As the baby crib is the largest piece of baby furniture in the room, it just makes sense to find creative ways to minimize its footprint in the room. We believe that a corner baby crib performs this task beautifully. ARE CORNER BABY CRIBS MORE EXPENSIVE? Corner cribs might cost a little more than a traditional baby bed. Once you consider their space saving qualities and the fact that they might do away with the need for additional pieces of baby furniture you may actually SAVE MONEY by getting a corner baby crib. Plus, if you have a friend who knows his way around wood, you might be able to find a pattern for a corner crib and talk him into making one for you for a cheap price. If you decide to make your own crib, please consider uploading some pictures of your project so that visitors that stop by Unique Baby Gear Ideas can see your woodworking project.